A 90 minute sampling from ten years of award winners, crowd pleasers, and staff favorites. Festival Director, Skizz Cyzyk, will be there to introduce the program and answer any questions. 8 pm at Creative Alliance (3134 Eastern Avenue), $8, $6 members. Free popcorn! 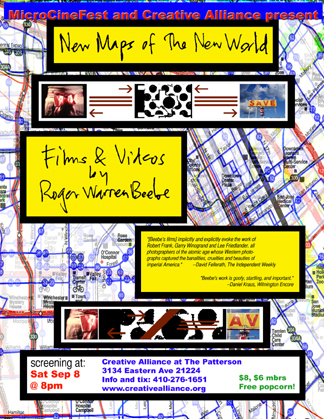 Roger Beebe is a professor of film and media studies at the University of Florida. His work has been shown around the globe at such unlikely venues as McMurdo Station in Antarctica and the CBS Jumbotron in Times Square, and at more likely ones such as the Museum of Modern Art and the Pacific Film Archive, as well as at countless festivals including Ann Arbor, Baltimore's MicroCineFest, NY Underground, the Images Festival, EMAF (the European Media Arts Festival), and Rotterdam. From 1997-2000 he ran Flicker, a bi-monthly festival of small guage film in Chapel Hill, NC, and he is currently artistic director of FLEX, the FLorida Experimental Film/Video Festival. With a documentary sensibility and a photographic eye, he brings humor and soul to subjects from women in the Air Force during WWII, to where Shaquille O'Neal got his last name. Roger Beebe is no stranger to the MicroCineFest audience, having screened seven of his films at MicroCineFest over the years, including S A V E and (rock/hard place) (MCF 2006), One Nation Under Tommy (MCF 2005), Famous Irish Americans (MCF 2003), Composition In Red & Yellow (MCF 2002 Small Guage Award), Strip Mall Trilogy (MCF 2001 Way Cool Super8 Film Award), and What Boys Want (MCF 2000 Way Cool Use Of A Lite-Brite Award). MicroCineFest is proud to continue the tradition of inaugurating new Creative Alliance screening spaces, by bringing Beebe to town for a screening in the new CAmm Media Lab, followed by Beebe's No Camera Required workshop the next day (Sunday, September 9).